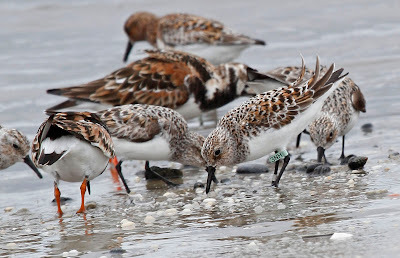 I am volunteering again this year to be a Shorebird Steward along the Delaware Bayshore. 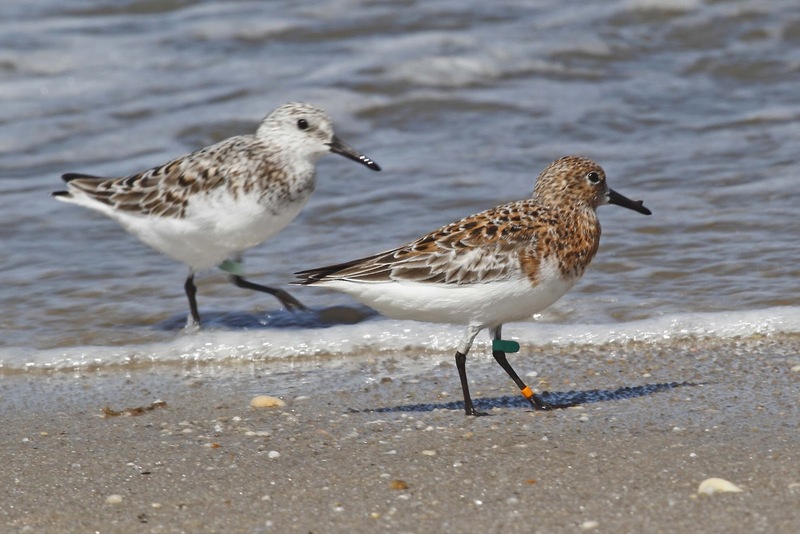 The NJ Dept of Fish and Wildlife, in conjunction with Conserve Wildlife NJ closes several beaches in order to protect endangered shorebirds such as the Red Knot while they migrate from Argentina to the Arctic. I did this last year too and I think it is an important way for me to engage with wildlife conservation in addition to simply running around looking at birds. If you want to learn more about this important issue, go to http://www.conservewildlifenj.org/protecting/projects/shorebird/ and http://www.nj.gov/dep/fgw/ensp/redknot.htm . Diane joined me this year, so we were stationed at either end of the closed area in the Villas. I was stationed at the north end of the closure at New Jersey Ave while Di was stationed at Rose Ave which is at the south end. 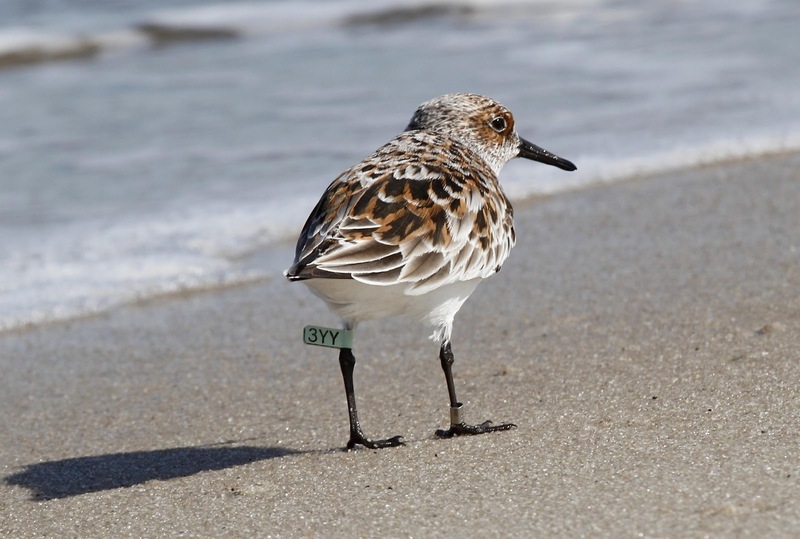 I had a great time talking to people, getting them to take surveys, and scanning the thousands of birds to find any that had been banded. I met new friends, got 12 surveys completed and over 50 banded birds documented and photographed. Di didn't have such a good experience. 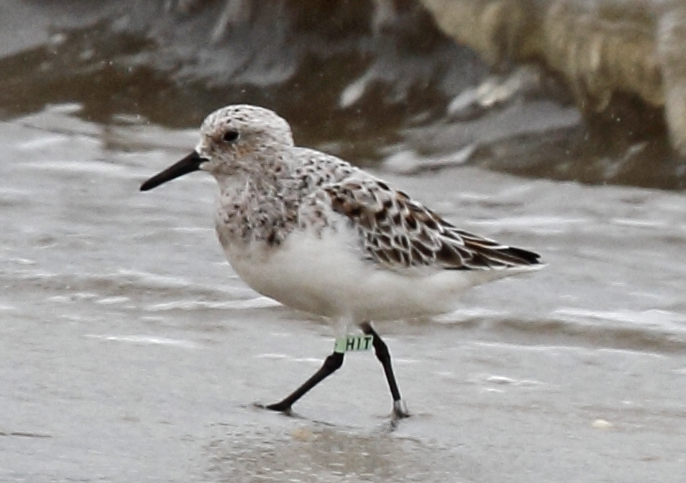 She didn't get any surveys completed and only got 4 banded birds. I guess I had the better end of the beach! This is what the beach looks like as the tide starts to go out. Thousands of Sanderlings and other birds running along the water's edge picking through the sand for Horseshoe Crab eggs. 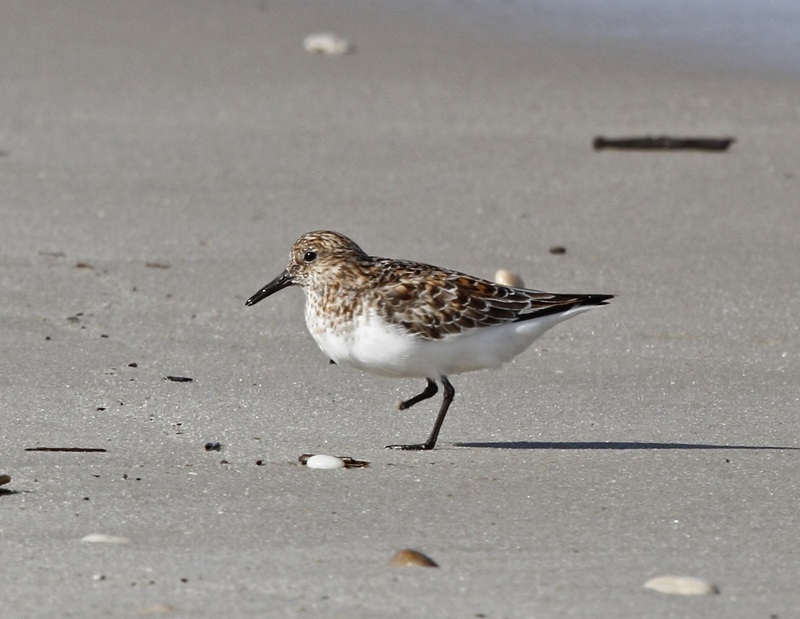 The birds concentrate at any point where there is a spit of sand. I guess that is where the most crab eggs are exposed. Here is a closer look at the birds and an unfortunate Horseshoe Crab which is on its back. We walk along the beach each morning "flipping" crabs but we are not allowed inside the closed beach, so we watch in vain as these crabs lay upside down all day until the tide comes back in. Hopefully, they will flip themselves back when the water surrounds them. This photo also shows a variety of birds - Ruddy Turnstone on the left in front of the crab, Dunlin on the right closest to the camera, and 6 Sanderlings of various colors in the middle - one of them is banded. This is 3YY. He is in process of molting from dull winter gray to vibrant summer brown. He hung around my area alot and was photographed too many times! 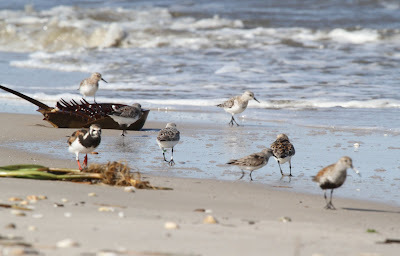 This happened a few times, where 2 banded birds ended up in the same photo. Meet AM4 and P2Y. 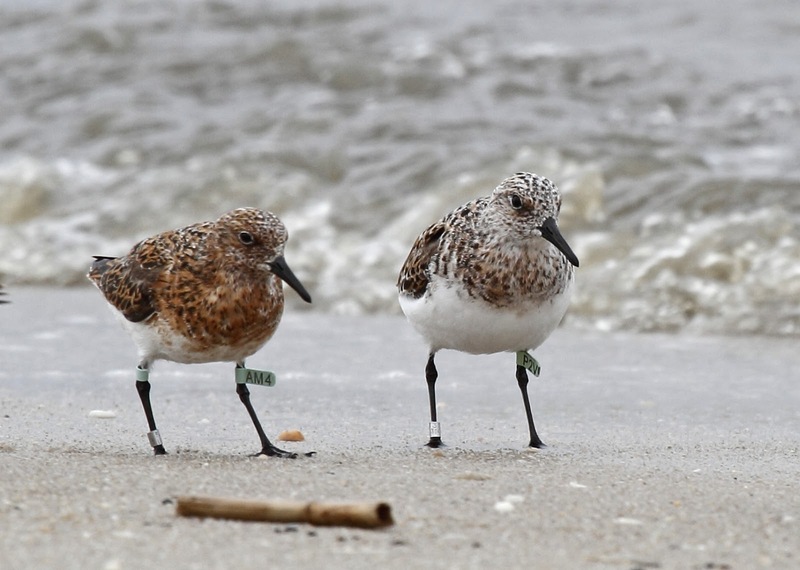 They are the same species - Sanderlings - but in different stages of molt. AM4 is almost ready to get a mate while P2Y still has a ways to go. Here are 2 more banded birds in the same photo. They guy in the front is interesting. He has different colors of bands and no number/letters. I can't wait to get the feedback on him after I enter him into the database. The HITS just keep coming. Actually, this is H1T, but I called him/her HIT. That is a wave crashing on the beach in the background. Here is KM8. I snapped this photo just as he was snapping up a crab egg. You should be able to see a small greenish egg in his bill if you click on the photo to enlarge. Here is Stumpy. this guy/gal hung around my beach all weekend and looked like he was getting around just fine even though he is missing a foot. 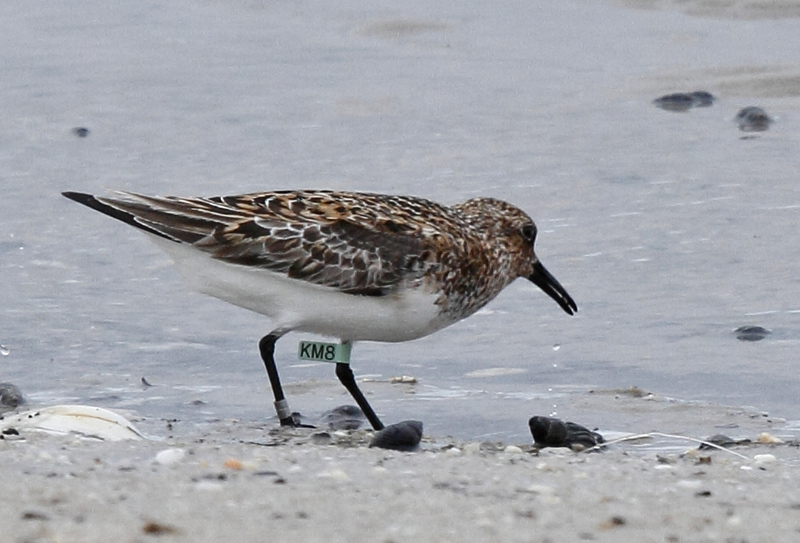 He wasn't the smallest bird on the beach which means that he is managing to plump up on crab eggs before heading to Canada. You go Stumpy! Please post a comment and let me know if you like seeing these photos. Also, let me know who is your favorite banded bird so far. Great pics w/ the tags!